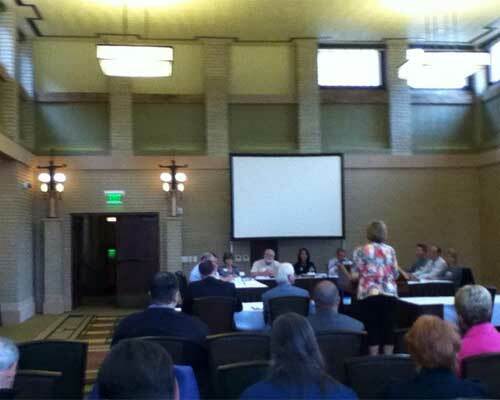 Rep. Sharon Steckman (D-Mason City) speaks out in support of the Council’s petition before the Iowa Environmental Protection Commission at a September meeting in Mason City. The Iowa Environmental Protection Commission is expected to make a decision on the Council’s petition for clear goals for cleaner lakes at its October 14 meeting in Windsor Heights. Why is action on this issue so important? Here are selections from actual comments the Council’s supporters have submitted. When the Council made a presentation on our petition at the Environmental Protection Commission’s September meeting, we submitted complete versions of these comments and many others. You still have time to add your voice by submitting your comment now. I do open water triathlons. I would be delighted if I could find even ONE Iowa lake with clear water where I could see my hand when swimming. I am required to suspend open water training every July because biological activity in Black Hawk County (George Wyth Lake) triggers an allergic reaction. I am always tempted to move my competition events out of state because I know there are triathlons with clear water for the swim. I very strongly support the rule making request filed by the Iowa Environmental Council and Environmental Law and Policy Center. I might add that I grew up on a farm and have been involved in farming, which is no easy enterprise. Yet, farmers should not be permitted to continue using practices that push the costs and consequences of soil and chemical run off onto the general public. As a mother, I want my two young boys to enjoy all the pleasures of outdoor play around water that I enjoyed during my youth in northern Wisconsin. Right now, I am fearful to let them play along the streams and beaches of Iowa. It’s painful to explain to them that something so natural as water could harm them. I hope you will work with me to change this situation by adoption clearer, numerical goals for water quality. I know from working in the business community that if you don’t set clear, measureable goals, it is much harder to succeed or even know if you have succeeded. Have you ever seen an algae bloom on a body of water? I have. I can’t imagine anyone wanting to swim in that gunk. Iowa can do better than that. I used to enjoy swimming, boating, and fishing at Geode State Park when I was growing up. I used to go canoeing on the Raccoon River and camp with my family at Rock Creek. Sadly, I can no longer experience those activities because of the pollution in Iowa sewers (formerly called streams, rivers, and lakes). Numerical standards are essential! We need even higher standards for lakes like West Okoboji. This is common sense. You can learn more about the Council’s petition on our website, and you can speak out in support of the petition through our action alert system. 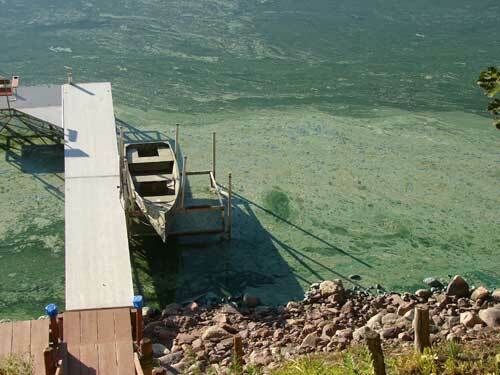 Is toxic algae coming to a lake near you? Posted on September 24, 2013 by Iowa Environmental Council | Comments Off on Is toxic algae coming to a lake near you? Summer should be a time for fishing, boating and swimming with family on our nation’s lakes. Yet instead of fresh clear waters, many users are encountering mats of thick blue-green harmful algal blooms (HABs) – aka toxic algae. A new report by the National Wildlife Foundation and Resource media highlights the toxic algae blooms that are fouling waters nationwide, including in Iowa. The authors have also launched an interactive map tracking reports of harmful algae blooms from across the country at toxicalgaenews.com. 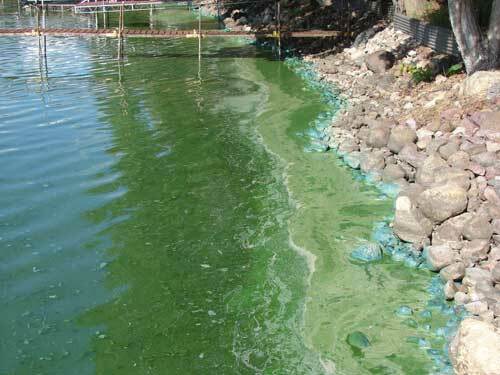 In addition to highlighting the health and economic impacts of harmful algal blooms, the report also discusses solutions for this widespread problem. It highlights Iowa farmer Mark Peterson who is making extensive use of cover crops on his farm to reduce nitrogen and phosphorus pollution in local waters. “One of the most effective things I do is use cover crops to soak up nutrients that move with any rainfall,” he says. “I aerial seed cereal rye before harvest so that it is already sprouted and growing by the time harvest is over. That way there is always something growing in the field which helps protect the soil and scavenge nutrients. This also will help build up organic matter over time. “I’m not alone in this practice – more and more farmers are shifting to a spring fertilizer application, along with planting cover crops. Why? It’s good for the farm. We like to say, ‘Don’t farm naked!’ Cover crops prevent the land from staying bare over the wintertime. They prevent soil erosion, keep the nutrients in the soil and improve soil health. By the way, the great “Don’t Farm Naked” t-shirt Mark is wearing comes from Practical Farmers of Iowa, a Council member organization. 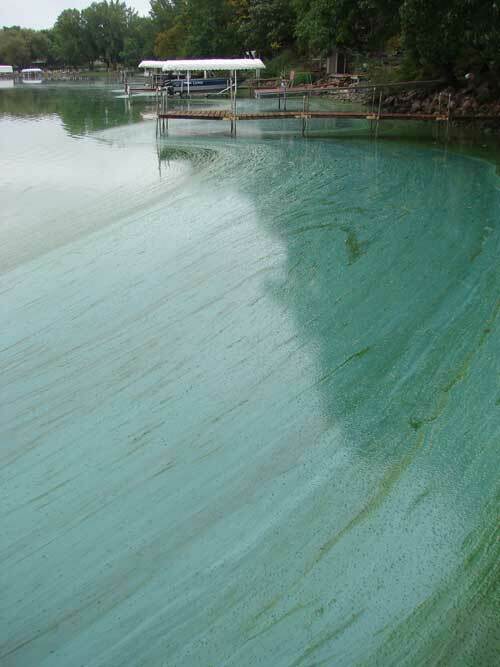 Comments Off on Is toxic algae coming to a lake near you? At the Iowa Environmental Council, we never lose sight of the fact that poor water quality in Iowa’s lakes and rivers has a real effect on people’s lives. My goal with these pictures is to bring awareness of the degree blue green algae exists in Center Lake and the desperate NEED to clean our lake. Center Lake empties into West Lake Okoboji at Hayward’s Bay, so it is vital our lake be healthy to protect the precious clean water in West Lake Okoboji as Lake Okoboji has a big economic impact on tourism and recreation of Iowa. Like many Iowa lakes, Center Lake is considered “hypereutrophic,” meaning nitrogen and phosphorous levels there are high enough the lake is prone to very poor water quality and frequent algae blooms. This is what those conditions look like. We are unable to convey the smell. Submitted to the Iowa Environmental Council by Sheryl Paul. The Iowa Environmental Council recently filed a petition with the Iowa Department of Natural Resources calling for water quality standards at Iowa’s lakes to focus pollution efforts on preventing these conditions before they occur. If you have a story to share about how Iowa can better protect its waters, or if you are working to protect waters where you live, we invite you to share your story with us.